The one that they are living and the one that they want to live. This guide will show you how to take your life from where you are to where you want to be. We call people who do this #lifestylebuilders, and we invite you to become one. Tom here. I’m really glad that you landed on this page. This is one of the most overlooked topics for those starting their own business. People who skip out on these steps make creating their ideal lifestyle way more challenging. Ariana and I have worked to evolve this framework over the years. We’ve trained and presented on the topic with rave reviews. Our hope is that it helps you as much as the thousands of other entrepreneurs who have embraced it. We use and recommend this process for both your personal goals as well as your business goals. Did it end up happening? Some people may actually be what they wanted, but for most of us we instead changed what we wanted to do or gave up on our dreams and the associated lifestyle. Maybe your parents told you that they weren’t realistic. Or maybe you were told that you needed to go to college and get a career. Maybe you tried and you weren’t able to make enough money to support yourself, so you settled for getting a job that would pay the bills. Whatever the reasons, most of us got to a point where we decided to stick with the traditional path, the “safe” path, instead of living our dreams. What is this “safe” path you may ask? You work for 45+ years. You fit in life and family around your job. At 65 (hopefully) you can retire and enjoy life. This is the path that most of us are on, but it does not lead to the lifestyle that most of us desire. And this was exactly the path that I wanted to avoid when Ariana and I were getting ready to graduate from college. And it scared the hell out of me! You see, Ariana and I met the first day of college. After 4 awesome years together, I knew that the lifestyle that we wanted to live was not going to come from that traditional path. No, we needed to do something different. I didn’t quite know what that was yet, but as we were graduating, I set a crazy goal. I declared that we would retire by age 35. I didn’t know how it would happen, but that didn’t matter. I set a goal and set out to make it happen. What we discovered over the course of working towards that goal was that there are a handful of key activities that set those people who build their ideal lifestyle apart from those who do not. So as we learned, implemented and refined these processes, other people started to take notice and ask us to show them this “secret” process that we created. Given that it isn’t a secret, we decided to start showing others the process. Since then, we’ve taught thousands of people this simple process. Do you prefer to learn through video as opposed to reading? 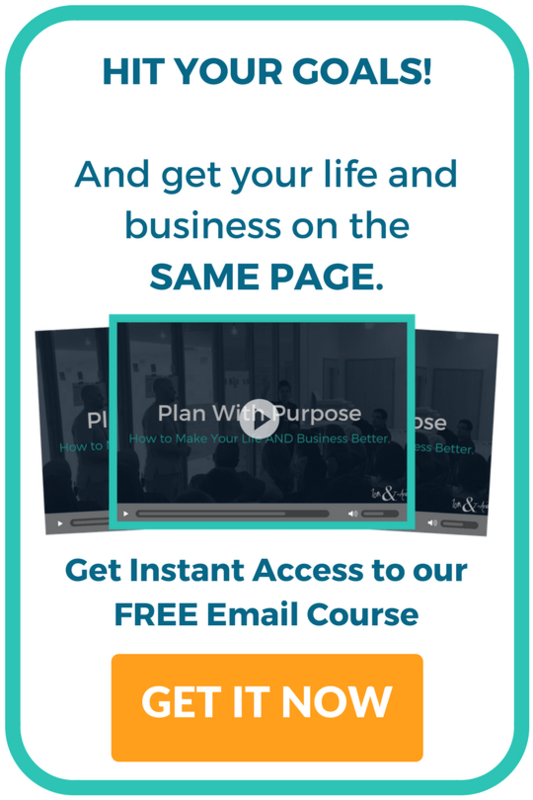 This guide is 10,000+ words long, but we also walk through all of the same content in our free “Plan With Purpose” video course. 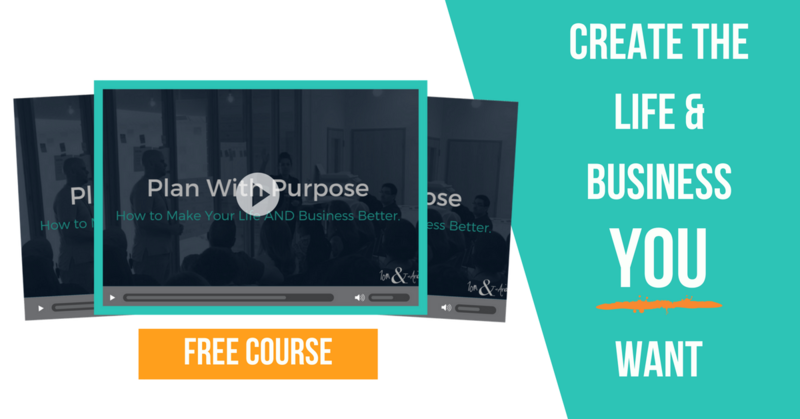 Get access to this video course for free below and begin creating your ideal lifestyle today. If you prefer to read (or you grab the video course and want to do both), then let’s dive right in! That’s one of the first questions that we ask most people who approach us who want help starting a business. And most people look like at us confused. Or like a deer in headlights. What we often find, and it was true the first time that we asked ourselves this question, is that most of us know that we want more out of life, but often we are not sure what “more” really means. So after you come to the realization that there is a gap between where you are and where you want to be, the next step is getting clear on where you want to be. I really like to use the analogy of using a GPS. When you use a GPS, you go through a few simple steps. Planning out your lifestyle is no different. So we will start with step 1, which is defining your destination. Now there are a lot of different activities that you can use to help you define your destination, but below are a few of the ones that we find people have the most success with. A vision board is a tool that you can use to help you clarify what you want to achieve and help you stay focused on those goals. With these defined, you can then describe the ideal business that will enable you to do the above 4 things. Make a list of experiences that you want to have as part of your ideal lifestyle. Make a list of the things that you would like to have as part of your ideal lifestyle. Make a list of the impacts that you would like to make in other people’s lives. Make a list of the things that you would want to cut out in your ideal lifestyle. Make a list of these characteristics that describe your ideal business which enables your ideal lifestyle. Now with all of this defined, you can physically (or electronically) create your vision board. Some people like just writing out their vision, but many people really benefit from putting images on their board. This then helps keep them inspired and focused on what they want in their ideal lifestyle. With some clarity on your ideal lifestyle vision coming from the creation of your vision board, another useful activity is thinking about what you want your typical day to look like. Often times people talk about their “ideal day”. This is often defined as your ultimate day. Although this activity is good, the reality is you will likely not be living your ideal day every day. It is not practical, and to be honest, it would not be as special if you did it every day. So instead, we like to have people define their ideal every day. Where your ideal day might be sitting on the beach, getting a massage with a pina colada in hand, your ideal everyday describes how you want each day to look for you to allow you to achieve your ideal lifestyle. In order to do this, take a week and think about what your ideal schedule/routine would be. What time do you want to wake up each day? How much time do you want to spend working? What sort of self-care do you want to it in (ex. eating, exercise, meditation, etc.)? What time do you want to set aside for hobbies? What other things do you want to focus on/have involved in days? What time do you want to go to bed? As you go through the above questions, think in terms of the different roles that you play, such as son/daughter, husband/wife, mother/father, friend, etc. Also think in terms of the 5 F’s (Family, Friends, Fitness, Finance, and Faith). When you know that your ideal lifestyle and your ideal every day looks like, you can then proceed to step 2 below to determine the gaps and how to get started making it a reality. Thinking back to the analogy of your life like a GPS, we have knocked out the first item. So we can now move on to the next step, which is defining your starting point and then plotting out a course/roadmap to guide us towards our vision. For each item or category on your vision board/ideal every day, you want to describe where you are currently at in relation. So now all that’s left is defining the milestones to go from your starting point to your destination. A useful way to do this is thinking about a few of the key changes that you would need to make to go from the starting point to the destination. This now helps you clarify the destination, the starting point and some key actions/milestones that would be required to make the shift. Today you currently drive a 2010 Toyota Camry LE. You now know that you currently drive a 2010 Toyota Camry LE with a $2,000 car loan balance but you want to be driving a 2018 Mercedes Benz E400, which costs $58,000. In order to make the change, you need to pay off your current car loan, figure out a way to either save $58,000 or a way to generate an additional $1,000/month for the car payment and finally sell your current car. You will want to continue going through this process with each of the major areas and/or items on your vision board and ideal every day. After defining your destination, your starting point and changes required for each aspect, you now want to combine these all together into a single roadmap (plan). For this, you will take the major categories of your vision board and lay them out. Then, you will take the goals within each category (ex. leave your job) and put them on the ideal timeframe for when you want that goal to happen (ex. 3 years). Continue this process with each goal. This will create a visual map of where you want to be (vision) and the key goals that will get you to your vision. You may find as you start placing your goals in time windows that some windows might be overloaded and you may need to shift some goals forward or backward. Once you have made any shifts and are happy with the timing, then you want to start looking at the changes required for each goal and maps those into timeframes to achieve your goal. For example, for the goal to leave your job, in the next 90 days you will reduce your living expenses so that you can live on $40,000/year instead of $50,000. This means that you need to bring home $3,333/month to cover your expenses. You don’t want to break this down any further at this point, but now you know the key focus for the next 90 days to move towards this goal. Important Side Note: There is a lot more to consider financially when leaving your job. Some of your expenses may go down (ex. spending less on gas), but some will also go up (ex. you will have to pay for your own health insurance and you will pay more in taxes because of self-employment tax. If you are looking to leave your job, we have put together an entire post walking through the process to help you crunch the numbers in an easy way to know exactly how much you need to bring home, how much you need to have saved, how much your business needs to make and how to plan it all out. Many people leave their jobs too soon and end up sabotaging their business, so be sure to check out this free guide so that you don’t become one of them. Then maybe in the 90 days after that you will spend educating yourself on different businesses that you could start to begin replacing your income. 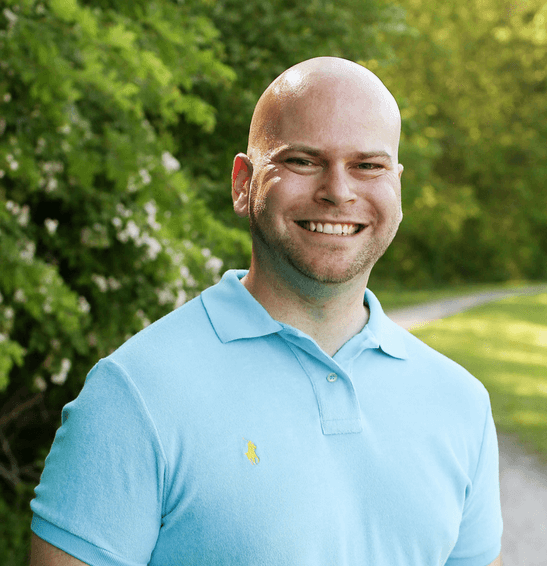 90 days after that you want to have sold your first $5,000 with your business. In one year you want this business to be generating $1,000/month. In 2 years, you want to be generating $2,000/month. In 3 years you want to be generating $4,000/month with $20,000 in savings so that you can leave your job. 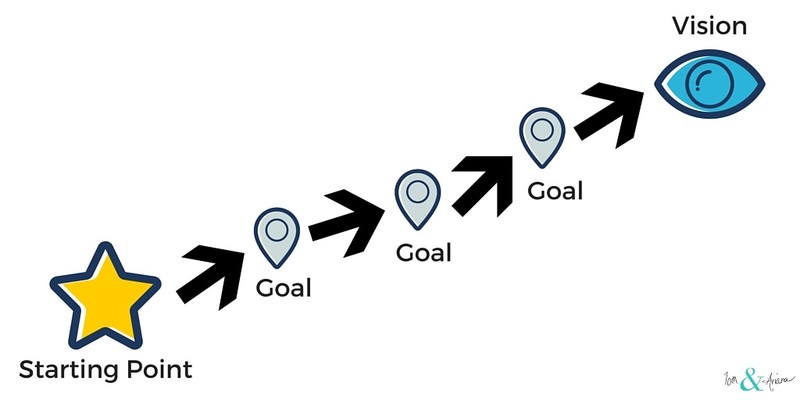 Repeat this process for each goal and you will end up with a consolidated roadmap (plan) for where you want to go, where you are today and the key changes/milestones that you need to accomplish along the way to make it happen. With your roadmap now laid out, you have your initial plan for how you will close the gap and begin moving towards your ideal lifestyle. But before you move on, I want you to ask yourself one question… what is preventing you from living your ideal lifestyle today? What things could you begin doing right now? Often times we think we need to wait and achieve something, but more often than not you can instantly make changes to your routine/lifestyle to begin living closer to your ideal every day today. For example, if your ideal every day has you waking up early, see how you can begin doing that now. Or if you want to begin eating healthier, think about what you can begin implementing right now. Want to spend more time with your family? Plan our your week and put the most important activities on there first. You are probably a lot closer to being able to do some of these things than you realize. The first two steps were fun. You got to envision the future and think about all of the cool stuff that you will build into your life. You have a cool vision board and roadmap defined for how you will make it all a reality. And now… you need to actually work on implementing first set of changes that you’ve defined on your roadmap. This is where “the rubber meets the road” as they say. And this is also where most people stop. Have you ever watch people set new year’s resolutions? Or maybe you have set some yourself? You get all excited, and January 1st you hit the ground running. All is good for a few days, then a bump in the road happens (pun intended). And suddenly things get off track and 2 weeks later you have stopped working towards your goal. We don’t want this to happen to you, and step 3 is where we begin differentiating our Plan With Purpose process from traditional goal setting. You see, you need to define and implement a process that works for you and will let you implement (and more importantly adjust) your goals as you go. Just like a GPS, you need to check in and adjust (aka. recalculate) your route based on what happens. By setting check-in points, you will have the opportunity to reflect and evaluate your progress while also making adjustments and planning out what to do next. You can define what check-in points work well for you, but here is a starting point that you should consider incorporating into your own process. You are likely already familiar with this check-in point as we already discussed it. Most people do an annual check-in, often as the end of the year approaches. They reflect on the year and set some resolutions for the upcoming year. Unfortunately, this is where most people stop. Doing an annual (once a year) check-in is a great practice. Not only does it allow you to reflect on the prior year and plan the upcoming year, but it is also an opportunity to step back and look at the big picture. This is a time for you to review your vision and your progress towards it. You may find that some things on your roadmap need to move up or move back. You may have some new goals to add or some that need to be removed or adjusted because they are no longer valid. When: Once a Year. Most people prefer somewhere near the end of the year, but as long as it is consistent, you can choose when you do this. Reflect on the previous year. Create a list of wins (what went well), challenges (what didn’t go well) and come out with a small list of adjustments to make in the upcoming year to minimize/overcome the losses. Update your roadmap. Take a look at the various goals that you have listed and make any changes/adjustments. Move goals forward or backward, add/remove goals and break down goals as needed. Desired Outcome: Clarity and an updated plan. You should have made any updates to your vision & roadmap and specifically have key goals laid out for the year with milestones broken down by quarter (90-day) chunks. By going through this activity each year, you will not only provide yourself with the time to reflect, learn and let go of the previous year, but you will also be able to make adjustments and get clear and focused on what is most important in the upcoming year. After going through your annual planning, you will now have some goals and milestones for each quarter. This makes it much easier to do your quarterly check-in. Whereas your annual check-in was focused on the prior year, the longer term future and the upcoming year, the quarterly check-in is just focused on reflecting on the previous 90 days and planning out the next 90 days. When: Once a quarter. This is generally done at the start of each quarter of the year (January, April, July, October). Reflect on the previous quarter. Create a list of wins (what went well), challenges (what didn’t go well) and come out with a small list of adjustments to make in the upcoming quarter to make sure you are on track to meet your annual goals. Plan out the upcoming quarter. Review and adjust the goals you initially planned out for the upcoming quarter. Again, this should be a small list of 3-5 for your personal life and 3-5 for your business. Then go a step deeper and define the key 3-5 actions that you need to do to achieve each goal and establish a high-level schedule for the quarter. Desired Outcome: Clarity and an updated plan. You will now have an understanding of your goals, the key activities to focus on to achieve them and an initial schedule for the next 90 days. This will help you focus and avoid getting distracted. By going through this activity each quarter, you allow yourself time to reflect and adjust. This is the key to actually achieving your annual goals. With your quarterly planning complete, you now have clarity on your focus and key activities for the next 90 days. A quarter consists of 3 months. Therefore, doing a check-in each month will then allow you to make adjustments along the way to achieve your 90-day goals. It will also allow you to review your key metrics and plan out your monthly budget. When: Once a month. This is generally done at the near the end of the month so that you have current data on your KPIs (key performance indicators) as well as your financial information. Review your KPIs. Review if you are on track or off track to achieve your 90-day goals. Review your key metrics for each goal and determine if you need to make any adjustments in order to achieve your 90-day goals. Establish your monthly cash flow plan. Each month you should create a cash flow plan, which is basically defining how much money you anticipate coming in and how you plan to spend it. Some people may also call this a budget. If you are not familiar with or doing this today, you are making things much harder on yourself. A budget is not restricting. In fact, it is freeing and allows you to be intentional with your money and make better decisions. Desired Outcome: Clarity and an updated plan. You will now have an understanding of how you are progressing on your goals and any adjustments that you need to make to achieve them. You will also have clarity on your money and a plan for how much money you plan to bring in over the next month and how you plan to allocate it to your different priorities. By going through this activity each month, you can make the smaller adjustments required to achieve your 90-day goals. It also provides you the opportunity to review your finances and plan out your budget for the upcoming month. This is a missing piece for most people and causes them to get into debt and make poor decisions because they don’t have an accurate picture of their finances (both personal and business). Your weekly meeting is the heartbeat of your life & business. When you plan out your week, you can get down to the specific tasks that you need to complete and also plan out your calendar. This is a great opportunity to utilize your calendar. You can plan out specific time or blocks of time during the week so that you know day by day and hour by hour what you should be focused on. Just like with a budget, some people feel like this is restrictive, but it is actually very freeing! It allows you to be intentional with your time and spend it in the best way to create the lifestyle that you want and to achieve your goals. When: Once a week. The day doesn’t matter, as long as it works for you and is consistent. Report and check in on metrics. Review your key metrics and any key activities that happened during the week. Also, spend some time defining what things went well and what could be improved. Then define a few actions to focus on this week to improve upon the prior week. Plan out your upcoming week. With an understanding of the prior week and where you stand with your metrics, you can now plan out and break down the top priority items that you need to focus on/complete this week. Desired Outcome: Clarity and an updated plan. You will now have your upcoming week planned out. This makes it so much easier to be productive and knock out the right activities because you have planned them in advance. Traditionally people would try to to get very detailed in their 90-day plans, planning out every task for every week. But then as things changed, they would spend a lot of time planning and replanning. By having higher level plans and implementing this weekly meeting to break them down into tasks, you can reduce the time you spend on planning and allow you to adjust to whatever comes up. Last, but not least, is the daily check-in. This meeting allows you to connect and clarify your intentions for the day. By doing this, you can make sure that you are clear on what you need to do and not waste time or get distracted by things that you shouldn’t be focused on. When: Once a day. Most people prefer the morning. We call our daily meeting drink up and sync up. We drink our caffeine and plan out our day. Items completed yesterday. Review key items that were completed the prior day. This is also a great way to keep others updated (spouses or team members in your business) and also to keep accountable. Collaboration for barriers. Define if there is anyone that you need to work with or if there is anything getting in your way. That way, you can coordinate those discussions or get help with something blocking your progress. Desired Outcome: Clarity and an updated plan. You know have clarity on your day as well as those around you. You also can make sure that you have the coordination or help to make your day productive. These daily meetings should be short (15 minutes or less). They are not met to be a full information dump, but instead, are meant to allow you to focus and collaborate quickly so you can be off to the rest of your day. When we first describe this process to people, people usually tell us one of two things. The first is that this would take too much time and that they don’t have that much time. The second is that this is too structured for them and they are too creative, so this won’t work for them. In terms of time, doing these meetings in this way will actually SAVE you time. Most people don’t realize how much time they waste doing the wrong tasks, getting sidetracked with non-important things or waiting to speak to someone or to have a roadblock removed so they can continue. These meetings help avoid and adjust to each of those, actually saving you that time. In terms of creativity, following this structure will actually allow you to be MORE creative. You can define and get clear on what needs to be done, as well as intentionally set aside time to be creative. This creative time then doesn’t get sucked into some of the other time wasters mentioned above. Obviously, this is a starting point, so you should try it out and adjust it to suit your needs. Everything up to this point has been helping you lay the foundation and get the structure in place. This does take some time to do, but it then makes it so much easier to execute and get stuff done. In this step, we now actually get in and use this foundation to begin implementing on everything that you need to do. As you begin this process you may find yourself overwhelmed. You have such a backlog of things that you need to do for your life and your business that it can be difficult to know where to begin. If this is the case, a brain dump might be the solution for you. This is one of Ariana’s favorite things to do when she gets overwhelmed. What is a “brain dump” you may ask? You take a piece of paper, a whiteboard or your favorite notes app and start dumping all the tasks that are on your mind that you need to get done. Below is an actual example of one such brain dump that Ariana did. As you can see, under each category you can see a list of things that she thought we needed to do for our personal lives and for each business. Getting this out of her head then allowed her to free up space and allowed us to then prioritize and plan out which ones we needed to focus on right away, which ones we needed to plan, which ones we needed to delegate and which ones we needed to delete. More on how to do this in the next section. They key thing here is that it is hard to move forward when everything that you need to do (or think you need to do) is in your head. It’s kind of like your web browser when you have too many tabs open… everything slows down and it is hard to focus. When doing this brain dump, be sure to keep your goals handy and make sure that you’ve included the key actions required to allow you to achieve those goals in the list of things todo. After performing your brain dump, the next step is to group and prioritize everything that you listed. Below is an example of how you can do this. You can group your todos by your personal life and your business. Sometimes it helps to also group your business todo by sustaining (things that you need to continue to do to keep your business going) and growth (things that you need to do to grow your business). Breaking things up this way will help you to see where your time is being spent and will help you automate/delegate things that you shouldn’t be focused on (often those tasks in the sustain category). With the todo items now grouped, the next step is to prioritize them. For this, we use something called the Eisenhower Matrix. This process was used by Dwight D. Eisenhower, the 34th President of the United States. The quadrant was the secret behind Dwight’s productivity and has been one of the foundational productive practices of many successful people. It’s pretty simple. Here is how you use it. For each task that you have to do, figure out which quadrant in the matrix that it falls into. 1 – Urgent & Important (Do First): These things should be done right away. When planning out your day, these items should be at the top of your list to tackle. When this is combined with techniques such as using pomodoros (short periods of intense work followed by a small break) or kanban (focusing on a single task at a time), it can be incredibly powerful. 2 – Less Urgent & Important (Schedule): These tasks are important but may not need to be done right away. These tasks you should schedule and include as part of your weekly planning meeting. 3 – Urgent & Less Important (Delegate): These tasks are urgent but are not important. These tasks should be looked at as prime candidates for automation and/or delegation. 4 – Less Urgent & Less Important (Don’t Do): These tasks are less urgent and less important. This is often hard for most people to consider, but these tasks should not be done. By looking at each item in your brain dump/task list and going through this prioritization process, you can quickly label each task with a priority and determine what action you should be taking. Once you have everything prioritized, the next step is to then organize your tasks for the week and begin working on them. 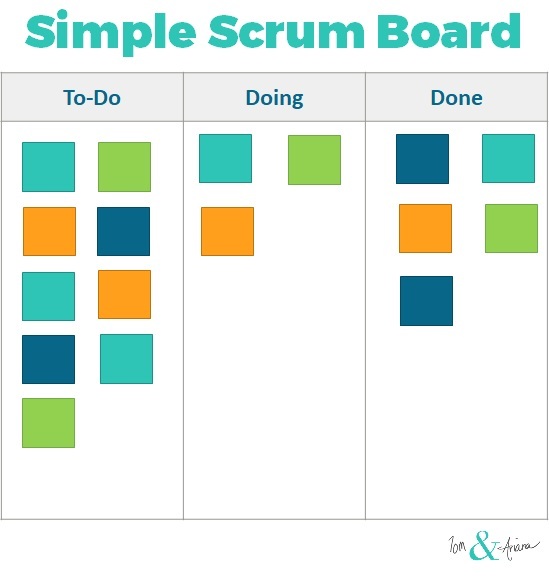 To do this, you will use a simple scrum board. Scrum is a set of principles and practices to help be more productive and more adaptive to changes. A scrum board is a way to visualize and manage your work. Here is how you set it up and use it. 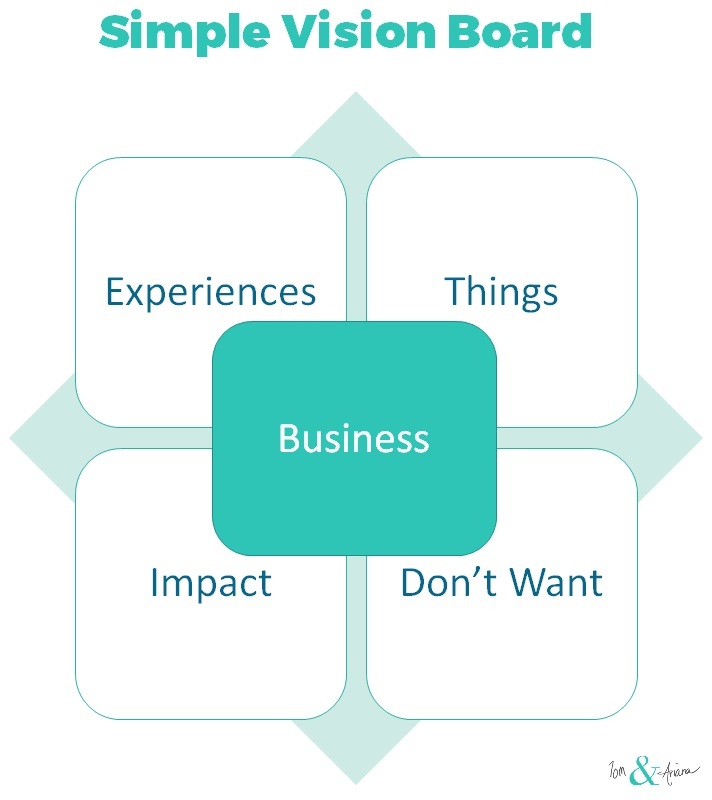 Step 1 – Create a board with 3 columns – To-Do, Doing, Done. This can be created using a wall, some painters tape, and Post-It notes, which I recommend for everyone that I work with that are just getting started. It can also be done with an electronic tool, such as Trello. There are many tools out there, but don’t get caught up in finding the perfect tool. A wall or the simple tool like Trello is all you need. Step 2 – Populate the To-Do column with your prioritized list of tasks. Step 3 – When you begin your work, move the top card (task) from the To-Do column and into the Doing column. Step 4 – Continue working on this task until you complete it. At that point, move it from the Doing column to the Done column. Step 5 – Continue this process with the next task. Note: There is more to Scrum than what I’ve described here, but this will get you started. So create your board, prioritize your tasks (focused on one week’s work at a time) and limit your work in progress to no more than 3 tasks at one time. At this point, you should be ready to dive in and get to work. You’ve dumped everything out of your head, used your goals to help you prioritize all of those tasks and have now established a simple process to see your prioritized list of work that allows you to focus on only a few of those items as a time. There is one additional strategy that we love to use as we plan out our week, and that is organizing and blocking off time in our calendars. 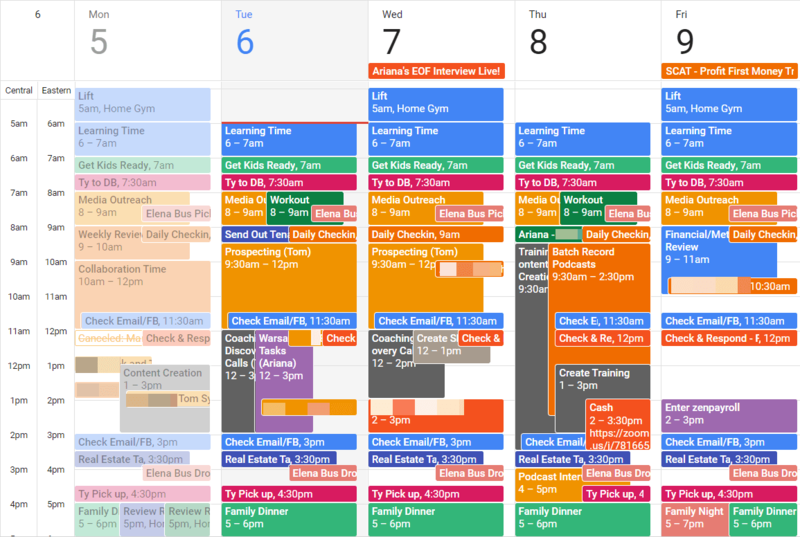 We use Google Calendar, but you can use any calendar that you like. The first step is to create multiple calendars. Each calendar will be used for a different purpose. Below are the calendars that we currently use. One calendar for each member of our family, as well as one for combined family activities. One calendar for each business that we own. One calendar for timeblocking. This is basically blocking out periods of time for specific tasks, such as holding coaching sessions or creating content. You can use as many or as few calendars as you want. The key is being able to organize different types of activities. At a minimum, I’d recommend at least 2 calendars; one for personal items and one for business items. With that, as part of your weekly planning session, you can then plan out your calendar and any key activities. You first want to place any personal items on your calendar. This makes sure that you are keeping your personal and family items as a top priority and planning them first. With your important items now planned out, you can then begin planning time for business and business activities. This is what we call work/life integration (as opposed to work/life balance). You plan your life, then integrate work in between to support your ideal every day. Below is an example of our calendar. It may seem overwhelming, but that is because we have a lot going on (2 kids + 3 businesses). This video shows a brief walkthrough showing how we actually create and populate our calendar. We are constantly evolving this process to work for us, so don’t think that your calendar necessarily has to look like this, but instead use it as inspiration. You are now ready to dive in and get to work. You’ve got your processes and tools all established to know what you will focus on when. But with all of this planning, and with all the work that you will be doing, how do you know that it is actually moving you towards your goal? Without defining some key metrics, this can be a challenge. Now some people get scared when we mention metrics, but we are going to show you a simple process for both identifying the right metrics to track and some simple ways to track them. There are so many potential things that you could track that it is often difficult to pick the right metrics and to not get overwhelmed. To get our first metric, you will want to think about the end result that you want to achieve. For example, if your goal is to lose weight, how much weight to do you ultimately want to lose? If you want to make more money in your business, how much money do you want to make? As you can see, if you know that you want to achieve a certain result, it becomes easy to identify your first metric. For losing weight, you may want to lose 15 pounds. For making more money, it might be making an extra $5,000/month. To make this even easier, I recommend using the following format when setting your goals. By framing your goals this way, you can easily tell your starting point, your destination and the timeframe. You first metric then becomes your destination. This is known as a “lagging” metric. This type of metric will let you know if you have achieved the result, but only after the fact. For example, if you step on the scale and realize that you’ve only lost 3 pounds when you ideally should’ve lost 5 pounds, you will know where you stand but you can’t do anything to change the result now. So in addition to defining a lagging metric, you also want to define at least one “leading” metric. A leading metric will track the activity that will lead to the lagging metric. A key characteristic of a leading metric is that you can influence it to help achieve the lagging metric. For example, in order to lose 15 pounds, what key actions do you need to do? Well, you lose weight when you take in less calories than your body needs daily, or when you expend more calories than your body needs. To take in less calories, you could track how many calories you eat each day. For example, you may track your calories and target to take in 1,900 calories a day when your body needs 2,000 a day, meaning that you have a 300 calorie deficit. To simplify this process, you could prepare (3) 500 calorie meals and (4) 100 calorie snacks for the day. Then you simply track when you eat them. To expend more calories, you could track how many calories you expend each day. Given that this is a little more complicated, you could track how many times you work out, knowing that each workout will expend calories. By tracking these two metrics, you should be able to predict if the scale will show an increase or decrease in our weight. For a business example, you may want to make $2,500 a week. How do you do this? Well, if you sell a $500 product or service, you have to sell 5 of these products ($2,500/$500). So how do you sell these products? Well, you might reach out to people who are interested in a similar product and have a phone call with them. Let’s assume that for every 4 people that you talk to, one of them purchases your product. So to sell one product ($500), you need to talk to 4 people. Therefore in order to sell $2,500, you need to talk to 20 people (assuming that 1/4 or 25% of the people that you talk to purchase). In order to talk to 20 people on the phone, you need to reach out and request a phone call. If 1 out of every 5 people you reach out to agrees to get on the phone, that means you will have to reach out to ~100 people to get 20 people on the phone. So your leading metric to track should be # people that you reach out to. Assuming you know your conversion rate, you should be able to predict how many sales you will make based on the # of people that you reach out to. You should be tracking these metrics each day (ex. during your daily check-in) as well as weekly during your weekly check-in. If you get to your weekly check-in and you weren’t able to hit your goal, you can then reflect and make adjustments so that you can have more success next week. The other thing to consider as you define and track metrics is understanding and using both qualitative and quantitative metrics. Quantitative metrics are those metrics that you can count. The metrics that we defined above were quantitative metrics. They provide hard statistics but little insight behind them. Qualitative metrics, on the other hand, provide less hard data but allow for a deeper level of insights and understanding. This data is often messy and hard to aggregate, but provides answers to the question “why”. So you want to use qualitative metrics early on to understand why, then shift to quantitative metrics so that you can measure “how” and “how much”. Then anytime that you get stuck, add back in some qualitative metrics to help you understand why you are stuck and to get unstuck. It can take a little bit of time to nail your metrics, but once you do, you will make your life (and business) a lot easier to navigate. The metrics will act as a scoreboard and help show you were you are and guide your next move towards your goals. The last and final step in the process; distilling who you need to be. Kudos for making it this far. If you are reading this, then you have a drive and commitment to building the life that you desire and are willing to learn what it takes to make that happen. That is what this step is all about. You see, you can go through all of the steps above, but still not achieve the success and lifestyle that you are looking for. You are the biggest contributor and factor in your success. That also means that you are the biggest contributor and factor to your lack of success. So success all comes down to you, how you think and how you act. And this step will help you gain clarity around what that looks like now and what it needs to look like in order for you to achieve success. Our paradigms are how we view the world. Think of them as a set of glasses that you are wearing. Depending on the glasses, the world may look different, even though it is the same. For example, dark shaded sunglasses will make the world look dark, while red tinted glasses will give everything a reddish look. Successful and unsuccessful people have their own paradigms. People who are not successful often have a “victim” paradigm. In this case, they often seem themselves as a victim and lay blame to their situation or to others as the reasons that they are not successful. For example, they might say that someone else is successful because their family had money, or because they went to a great school. They look for excuses. They are often too busy or their circumstances won’t allow them to be successful. They say they “can’t”. They take away all of their own power and therefore often are not able to create their own success. Now, successful people often have a “victor” paradigm. They realize they are in control of their lives and the outcomes. They make sacrifices to get to where they want to be and find time for what is important. They are willing to admit that they made a mistake or that they don’t know something, and also willing to take action to overcome obstacles that get in their way. Going through steps 1-5 above will make no difference in your life if you have a victim mentality as you will always find an excuse for why things didn’t work. In order to truly benefit from them, you need to have the paradigm of successful people and be willing to take control of your life and what happens in it. Speaking of paradigms, there is an additional way that successful people look at things, which is often the opposite of unsuccessful people. Unsuccessful people look at things from the Have-Do-Be perspective. This falls back into that victim mentality. They are making an excuse (if they only had money), then they would be able to do something, at which point they would be happy. But of course they will never have enough money, therefore they cannot do the things to leave their job, and thus they will not be able to be happy. In the first example, the person was not thinking about who they needed to be/how they needed to think to have success. No, instead they were focused on what they didn’t have, which then prevented them from being able to do, which then prevented them from being. In the second example, the person focused on who they needed to be in order to do the things they needed to do in order to have the success that they wanted to have. You see, far too often unsuccessful people think they need to have before they can be. They think they need to make a million dollars before they can be successful, but this is backward. You need to actually be successful with your mind and actions in order to have a million dollars. You defined what you wanted to have above (your life vision and your ideal every day). You defined what you needed to do (your goals, milestones and key actions). Now you need to figure out who you need to be in order to do the things that you described above. Do you need to be someone that constantly learns? Do you need to be someone who sees problems as opportunities? Do you need to be someone who can continue past failure? Do you need to be someone who can work with others? Once you figure out who you need to be, it will then make it much easier for you to do the things that you need to do in order to have your ideal life. Another tool that will help you with determining who you need to be is a tool that is traditionally used to analyze businesses, but today we will use it to help you analyze yourself. By going through and asking yourself what strengths, weaknesses, opportunities, and threats you have, you can better understand yourself and play to your strengths/opportunities and work to mitigate your weaknesses/threats. Personality tests are another great tool to use to better understand yourself and may actually help you fill out part of your SWOT analysis. Here are a few personality tests that you can take to better understand yourself and how you may naturally act. So all of the previous things to review were all working towards this goal, which is helping you to understand who you are today and who you need to start being as you begin on your journey to build your ideal life. Look at the things that you outlined that you need to do to achieve your ideal life and your goals, then really start reflecting on who you need to be. Take a look at people who are doing what you want to do and who have the results that you are looking for. Talk to them, hire them, and really focus on understanding what type of person they needed to be to have their results. Then determine what shifts you need to make to be this person. Think about what new skills you may need to pick up. Think about what new habits you may need to develop. Also, think about what habits or characteristics you may need to adjust or drop. This is a critical one. If you want to be successful, you probably don’t want to go out and get drunk every weekend. So you may have to shift some of your habits. You may also need to shift some of the people you hand out with and are influenced by. We started this guide out with getting clear on what you wanted to have, then helped you figure out what you needed to do and ended with helping you clarify who you need to be. I know that it was a lot of information, but don’t let it overwhelm you. Grab the videos below and set aside some time over the next week to really dive in and map this out. And finally… starting being the person that you need to be to make this all happen. Do you want additional guidance to implement everything that you learned above? Be sure to grab the free video course where Ariana walks through this entire process and guides you through each step.